I only recently discovered the graphic novel of Alan Moores Watchmen, which is brilliant. It's gritty costume crime fighter type stuff about a bunch of anti-heroes (I think that's the best way to describe them...), only one of whom actually has any super powers. Anyone who enjoyed V For Vendetta or Moores Batman effort will most likely enjoy this. It's one of the best graphic novels that I've read in a while and no self respecting comic geek should fail to read it. 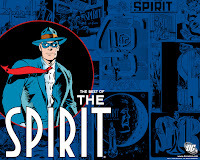 In a similar vein ther's also a film adaption of The Spirit being made by Frank Miller (Sin City, 300) that looks like it'll be worth a watch. I haven't read the comic, but I think I'll have to have a look.